The primary purpose of Friends of Roosevelt Park is to enhance the city park located at 9th Street and Roosevelt Avenue in Ames, Iowa. Our activities include outdoor concerts, public events for all ages, community building opportunities, and avenues for charitable giving. 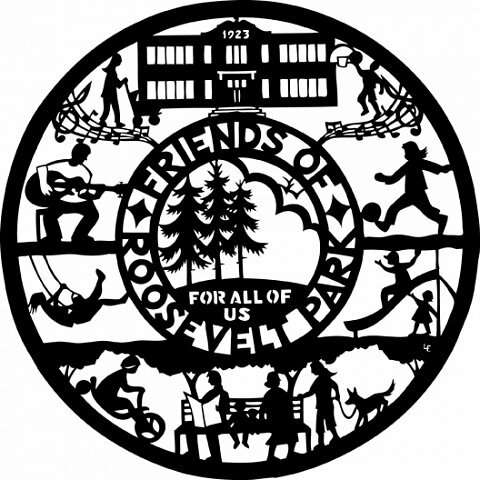 Friends of Roosevelt Park formed in May 2013 and encompassed the Roosevelt Summer Sundays Concert Committee and Citizens For Roosevelt Park. The Roosevelt Summer Sundays Concert Committee was established in 2003 to organize free, family-friendly, outdoor concerts from June to August annually. For more information on the Summer Sundays Concerts and this year’s schedule, please go to summersundays.org. Citizens For Roosevelt Park formed in September 2012 as the Ames Community School District debated the Roosevelt School building and ground’s future. CFRP’s 200+ members have been dedicated to preserving the valued green space at Roosevelt. As CFRP’s political activities have come to a close, focus shifted to park development, and we became Friends of Roosevelt Park. Papercut Art/Friends’ Logo: Linda Emmerson. Photos: Sue Ellen Tuttle. Web-design: Dan Conner.